If you’re ever being chased by the police, this guy was kind enough to show you exactly what not to do — video tutorial and all. A motorcyclist terrorizing the streets (translated: “being pursued for reckless driving) in Florida on Thursday seemed to think so, and the Martin County Sheriff’s Office released the whole thing on film. 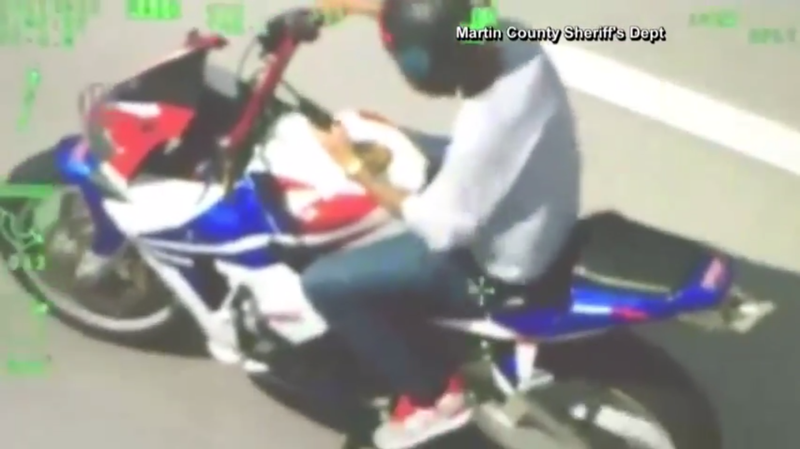 The rider took his hands off of the handlebars midway through the “intense” chase to focus all attention on his phone, officials told NBC Miami. I mean, getting run down by the cops would make a great home video. Might as well phone home and ask the family to tune in, right? No. A helicopter (whose pilot was obviously paying more attention than the motorcyclist) got in on the action too, recording the entire chase down Interstate 95 and eventual “strategically forcing” of the rider to pull over. No one was hurt in the incident, as the rider somehow managed to avoid other cars while his attention was elsewhere. Police took the guy into custody and he now faces multiple charges, if there was any question about that. The part we’re really curious about, though, is if somebody, anybody thought to ask him what was so important during that chase. A Twitter update? A text to mom? Anybody? Whatever it was, it probably wasn’t worth it. But it’s fun to guess.